The trail starts at Carosello 3000 with a wide and easy street going through those that in winter are ski slopes: it arrives at the alpine lake “Lac Salin”, and then it turns into an easy uphill until the top of the Federia Chairlift. From here the trail gets tighter and it goes in a more natural landscape, there’s some uphill, some of them pretty steep but always very short, and it continues by the side of the Mountain until arriving at a very panoramic flat. On the right the landscape opens on the swiss mountains, like the Mount Palù and Bernina. It goes on until reaching the “Madonon baitel”, a hut made with stones,open to the public with a stove, a small kitchen, moka for the coffee and crockery where it’s possible rest and warm up in the coldest months. 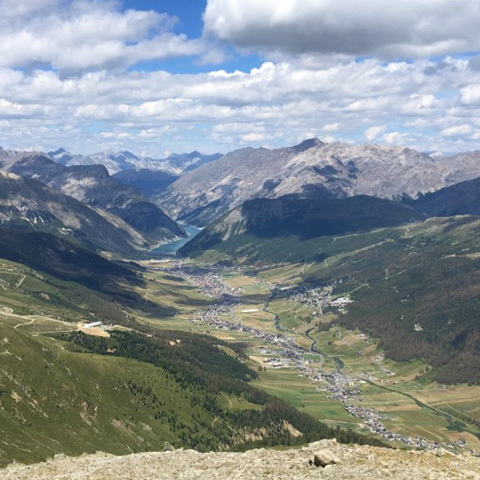 From here it’s possible to enjoy the best view on the Livigno valley and all the surrounding peaks. It’s worth going up on the small mountain above the baitel, where you will be completely surrounded by the mountains, and thanks to the binocular placed at the top, you can see and identify all the peaks. From Madonon starts the downhill (n°157) heading to “baitel del Canton”. The trail is very tight and difficult, but panoramic. After about 3km and 600m drop, the landscape turns green, and you walk in the grass until reaching the “Baitel del Canton”, where it’s possible to get some water and rest after the hard downhill. Here the trail split: one way continues the downhill on the trail n° 157.1, arriving at the Forcola area (following the directions Livigno/Camino), or it’s possible to go straight on the trail n°158, heading to “baitel del Plascianet”. This part is an up and down in enchanted meadows and forests, and after about 20 minutes it arrives at the third and last baitel. From here there are many ways to reach the village: the shortest and easiest is continuing straight on the trail (n° 158) that ends just below the intermediate station of the Carosello 3000 cableway, and from there going down with the lift; alternatively you can take the trail n° 157, going down in the forest arriving in the Forcola area. To go back to the start of the cableway, almost at the end of the trail turn left on the “Tee trail” (n° 190), where you can admire the typical wood huts of Livigno, that are called “Tee”. Staying on this trail, after various up and downs it arrives at the hut “Tea da Borch”, and going down from there for about 500m, it arrives on the streets for the parking. A very panoramic hike, in the first part you’ll walk at a step from the sky, with mountains at 360°, while in the second past you’ll walk in a landscape that reminds the one of the fairy tales with wild animals, wood houses, forests and meadows. 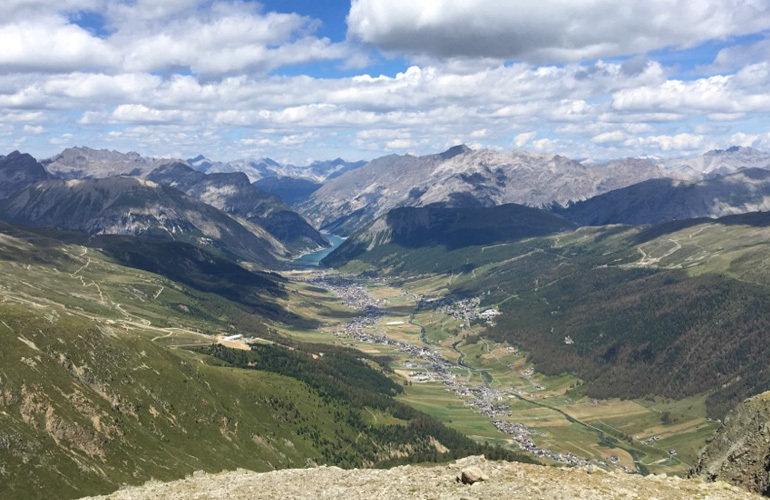 Always with an awesome view on the beautiful Livigno valley. A long and pretty difficult walk with a high negative drop, but with unique landscapes. Baitels are perfect places for a pic-nic: bring some sandwiche to enjoy in the nature, in case it’s cold, every baitel has a stove, a little kitchen and a table where you can eat. The most trained people can make the hike the opposite way (hence mainly uphill). In this case you can start from the restaurant “Camino” and go up on the trail n°157.1 until reaching the n° 157 that leads to Madonon. Consider that you’re walking at almost 3000m, hence the weather is very unstable and generally fresh: wear many layers and always bring an extra jacket to avoid being cold in the middle of the Mountain. In sunny days, you can risk sunburns since the UVA rays are very strong but with the fresh air you won’t feel them. To get the perfect tan often use solar protection and sunglasses. Bring some tea, coffee and biscuits: Madonon is the perfect place where to stop for a warm break during the morning. This hike is very panoramic: bring a camera or your phone to take many picture to post on Instagram with the hashtag #themountainisfreedom…you’ll be envied by all your friends!